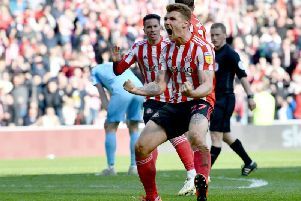 Stewart Donald remains 'optimistic' Sunderland will sign two strikers this month. Stewart Donald still expects Sunderland to sign two strikers before the end of the January transfer window. The Black Cats have less than two days to find a replacement for top scorer Josh Maja, after the 20-year-old forward signed for Bordeaux last week. Even before Maja's departure, Sunderland were already looking to sign another striker this month but negotiations have proved tricky. It is understood Wigan's Will Grigg remains Sunderland's No.1 target, despite the Latics rejecting four bids for the 27-year-old front man. That has understandably led to concern among Black Cats supporters, yet Donald remains optimistic the club will still sign two strikers before Thursday's 11pm deadline. If Sunderland can't agree a deal for Grigg, they could turn their attentions to Gillingham's Tom Eaves or Doncaster's John Marquis, following reports from Sky Sports that both are on the Black Cats' radar. They may also look to bring in another striker on loan after Jerome Sinclair returned to Watford earlier this month. Meanwhile Sunderland are closing in on Celtic winger Lewis Morgan, who looks set to join Jack Ross' side on loan until the end of the season.